The portfolio site is here! The new Editing Luke is a .com! I feel like I've written enough about why I created this, the time it took, and what this new site means. Let me just say that my first goal for 2010 is now complete. 1. 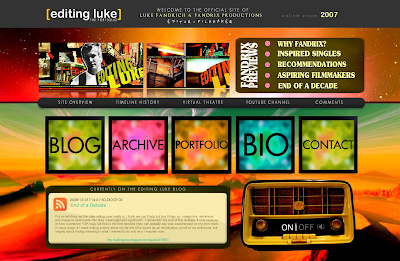 Click on over to explore Editing Luke: The Portfolio for yourself. 2. Visit my sneak peek for a brief overview of the sites features. 3. Be sure to check out the Archive section for interactive highlights (some never seen before). 4. Leave a comment here or in the comments section of my new portfolio site to let me know what you think (the new comments section on editingluke.com could really use some love). Thanks for checking out the new venue! Thanks, I'd like to think things have become better myself. There is certainly a clearer focus at this point than when I first began, I've found what works for me.